SUBHEAD: Why, given the trail of destruction it has left, are we still dancing to the Neoliberal tune? 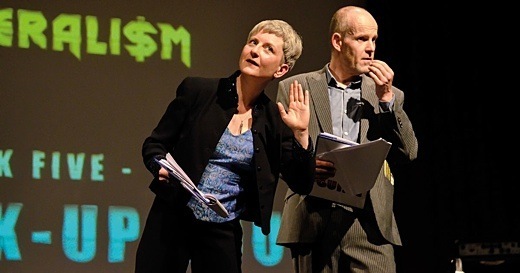 Image above: Sara Woods and Andrew Simms perform Neoliberalism – The Break-up Tour. They aim ‘to do the almost impossible: turn economics into entertainment’. From original article. Go for a walk with a friend in the dappled sunlight lie on your back and stare at the clouds. Economics tells us you’re happier doing a). How did we get here? And is the mainstream economic consensus of the past four decades now really falling apart? We created Neoliberalism – The Break-Up Tour, a fast-paced mix of stand-up and game show, to explore these questions and see if we could do the almost impossible and turn economics into entertainment. But while many aspects of neoliberalism’s current doctrine tend to comedy and even farce, few of the many millions on its receiving end have been enjoying the show. It is not entertaining how modern economics has got away with so much despite the lack of evidence in its favour – and so much demonstrable carnage in its wake. The Returned, in which people inexplicably come back from the grave to the bewilderment of friends and family. In April 1947, Mont-Pèlerin was home to an ideological resurrection and, as with The Returned, what came back was critically different to the previous incarnation. The architects of neoliberalism favoured a faith in free markets to best meet peoples’ needs, drawing on the tradition of Adam Smith, but taken to a new, extreme level. They coupled this to an equally extreme libertarian individualism. After some initial debate and a little falling out, they forged an assault on the public realm and the role of the state and a submission of the individual and society to market forces that Smith would have rejected. Adam Smith was the grandfather of market economics, but a more complex thinker than modern-day neoliberals like to remember. They hail the ‘invisible hand’ – the idea that self-interest and unfettered markets work best – and recall his famous discourse on the manufacture of the pin, revealing how the specialisation and division of labour led to huge increases in productivity. Less well remembered are his observations on the human consequences. The monotony would lead, he wrote, to the worker no longer being able to ‘exert his understanding, or to exercise his invention’ and becoming ‘as stupid and ignorant as it is possible for a human creature to become’. Worse, considering how many would become servants to mass production, their ‘torpor of mind’ would take away their capacity for ‘rational conversation… generous, noble or tender sentiment and consequently of forming any just judgement’. Smith also mocked the very consumerism that his market system would breed to feed itself, and was especially sceptical of corporate power, believing that whenever the two got together it would lead to a ‘conspiracy against the public, or in some contrivance to raise prices’. Most surprising of all for latterday neoliberals are his conveniently forgotten views on the vital roles of the state. It should, he argued, protect society from violence, protect every member from ‘the injustice or oppression of every other member’, and then, crucially, ‘erect and maintain those public institutions and those public works’ that, although of great value to society, are by nature not profitable and therefore should not be expected to be delivered by private enterprise. Smith’s forgotten early caveats to his market system are now coming home to roost everywhere, from the business models of Uber and Sports Direct, to failed railway franchises, the painful reprivatisation of banks and the creeping privatisation of the NHS. It amounts to an intellectual collapse of the neoliberal model. Neoliberalism’s original line-up gathered at the Hotel du Lac in Mont Pèlerin to discuss how to halt the spread of ideas that emphasised common purpose and governments acting directly in the public interest. It featured Milton Friedman and Friedrich von Hayek, scions of the Chicago School of Economics, Ludvig von Mises of the Austrian school, and philosopher Karl Popper. They set out to perfect a market system that would underpin their particular vision of a free society. Against a backdrop of highly interventionist economic planning during war time, and the rise of Stalin’s centralized, totalitarian state in the Soviet Union, they married an old, neoclassical belief in deregulated markets with newer liberal concerns about individual freedom. They sought to rescue the reputation of market systems from their ignominious failure in the financial crash of 1929, and champion pure individualism against all forms of collective organization. The ideological temperature was set by the Austrian American, von Mises, who accused neoliberal scions Hayek and Friedman of being ‘a bunch of socialists’. Many other influential neoliberal think tanks grew from this core group and their beliefs. But there were cracks even at the beginning. At least one who was closely involved at the outset sensed a fundamental flaw in their position. The philosopher Karl Popper, author of The Open Society and Its Enemies, did not stay involved. He had a more nuanced view on markets and freedom, pointing out that ‘proponents of complete freedom are in actuality, whatever their intentions, enemies of freedom’. Popper saw the logical consequence of ignoring how power, unregulated markets and unrestrained individual behaviour would interact, reasoning that this notion of freedom would, paradoxically, be, ‘not only self-destructive but bound to produce its opposite, for if all restraints were removed there would be nothing whatever to stop the strong enslaving the weak’. By Popper’s definition, neoliberalism wasn’t liberal at all. Nevertheless, from being viewed as extremists and outsiders, just over two decades of constant agitation and the proliferation of like-minded groups saw their rise to power begin with the breakdown of the post-war economic architecture, built to ensure maximum international stability. Neoliberalism has been on tour ever since, inviting itself to play all over the world. Like many of music’s big names, from the moment it was created, it started to exhibit the instability and volatility that would ultimately bring it down. 1971 saw the end of the Bretton Woods arrangement, a system that maintained ballast in the flow of money around the world and speculative trading on currencies. The end of these checks and balances waved the flag to allow money to move around the world much more easily and with greater volatility. A secondary banking crisis hit the UK as early as 1973-75, before a whole sequence of crises hit Mexico and Latin America from 1982. This period, with the private banks and international financial institutions in the driving seat, also created conditions leading to the African debt crisis – where everyone saddled with debt due to predatory lending was told to produce the same thing for export, suppressing prices globally, leaving them running faster to stand still, while being denuded of their natural wealth, and having their health and education systems trashed in the process. The 1980s brought the US savings and loans crisis, and ‘Black Monday’ in 1987 saw markets falling like dominoes from New York to London and Hong Kong. Then a whole carnival of market failure paraded through Finland to Mexico, Asia, Russia and Argentina before 1999, when things really started to fall apart. That year saw the end of the Glass-Steagall bank regulations, brought in to prevent a repeat of the 1929 Wall Street crash. Their removal allowed bankers to gamble with other people’s money (yours and mine) at virtually no risk to themselves, but with the chance to get vastly rich. Then came the dot.com crash in 2000-02 and the US energy crisis. These were speculative boom-and-bust crises, exactly what you’d expect when checks and balances are removed. They were quickly followed by financial implosions in Iceland, Ireland and then the great crash of 2007-08, triggered by the US sub-prime mortgage scandal. From there, attended by the neo-medieval blood-letting medicine of austerity, problems continued in the UK, Greece and across Europe, all to the tune of ‘The Cure is Worse Than the Disease’. It’s important to remember how recently neoliberalism retained its absolute grip on the imagination of the left. In his 2006 Mansion House speech, the year before the big crash began, the chancellor, Gordon Brown, said that many who advised him ‘favoured a regulatory crackdown’. He added, ‘I believe that we were right not to go down that road… and we were right to build upon our light touch system.’ His right-hand man, Ed Balls, said: ‘Nothing should be done to put at risk a light-touch regulatory regime.’ He didn’t say that nothing should be done to put at risk society, the welfare of the wider economy and the ecosystems on which we depend. If entirely self-interested private finance remains the beating heart of your economy, a bit of extra regulation won’t solve the problem. Because, as Galbraith also saw, regulators have a short, depressingly predictable lifecycle and tend to be ‘vigorous in youth, rapidly turning complacent in middle age, before either becoming senile or an arm of the industry they are meant to regulate’. Shareholder capitalism keeps the self-interest of finance in the economic driving seat. Without making finance actively subservient to broader social, economic and environmental purpose – by law and through different governance models such as mutual, cooperatives and social enterprises – we just get more of the same. And the very failures of the financialised economy are used to further entrench it. The answer to everything becomes more privatisation, liberalisation and deregulation. As long as that happens, its price is set by quality of life – and life itself. Cost-cutting and a weak regulatory system have led to the Grenfell Tower disaster. Ninety people per month die after being declared fit for work by the DWP and losing their benefits. Inequality has been rising for three decades, and we are on course to return to Victorian levels. Work is increasingly insecure and low paid. Five million workers give the equivalent of a day’s worth of free overtime to their employers every week. A model based on competitive, selfish individualism is blind to the fundamental mechanisms of collaboration, mutual aid, cooperation, sympathy, empathy and sharing that have been at the core of our development and success as a species. High-paid City bankers are estimated to destroy £7 in social value for every pound they generate. Advertisers are worse and tax accountants much, much worse. But look at childcare workers, hospital cleaners and waste recyclers, where the opposite is true. Although on desperately low pay, they create seven to 12 times more social value than the amount they are paid. We have been so indoctrinated by neoliberalism that even though research shows that the great majority of us hold values that emphasize caring, generosity, tolerance and cooperation, when we’re asked what we think are others’ values, we suspect most to be the selfish, competitive, individualistic poster children of neoliberalism. So what opportunities might open up if we give that more realistic and positive take on human reality a chance, and allow policies to be put into place for fair shares, cooperation and respect for planetary boundaries? Perhaps that would be a nice, simple policy test: does this proposal lead to a more equal sharing of economic benefits, a smaller ecological footprint and improved human well-being? If it can likely tick those boxes, give it a try. How do we do it? In many ways, the new world is already here, in the shell of the old. In Germany, banks are dominated by mutuals and cooperatives, with a clear mandate to help people and the economy rather than just themselves. In Holland, the four-day week offers a lower impact, better work/life balance. Despite all the obstacles, community-owned renewable energy, working for people and planet, is growing dramatically – by 17 per cent last year in Scotland, for example. Neoliberalism is in its intellectual death throes, unable to answer the systemic threats it has created. A better world is possible if we take away the excessive privilege of finance and make it subservient to real life. Money and the markets are not innate, they’re not like gravity, they’re human made contracts between ourselves about how we organize society. It’s time for neoliberalism’s zombie economics, peddling suicide finance, to stop touring and let those playing planet and human-friendly economic tunes take the stage.